My knitting-I-can-show-off and talking-about-knitting-in-public mojo were missing in action for a couple of months, but I've eased back into the swing of things with some slippers of many colours. I used Álafoss lopi with 5mm needles, for a finished fabric that's bulletproof-dense. 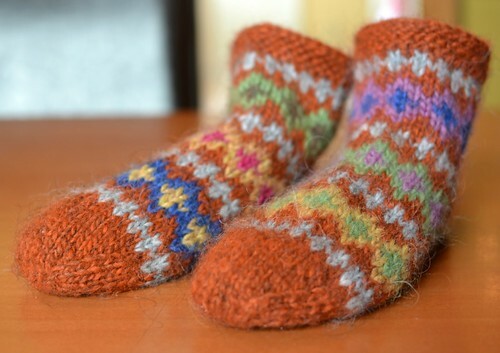 They're knitted from the toe up, beginning with a figure-8 cast-on, and have plain old short-row heels. The cuffs are finished with a few rounds of garter stitch and a moderately stretchy crocheted bind-off. I was racked by colour indecision when I was planning them, so picked orange for the background and used all the rest of the colours I had available in the foreground. These were a practice run at stranded colourwork patterns for a sweater I'd like to knit. There was a while where I wanted to make a lopapeysa for myself each year so I'd have a little archive of colours I liked or small repeating patterns that had been on my mind in years past in my closet. I got distracted from that ambition by about three dozen pairs of socks and discovering Herbert Niebling and cones of 2/28 silk thread, but now it seems to be back? The sweater will include many or most of these colours, but toned down by having the grey in the background instead of, uh, screaming orange. I'm knitting it concurrently with some smaller-gauge projects as a break for my head and heart and hands and wrists; maybe by the weekend I'll have a pair of sleeves to show for it! 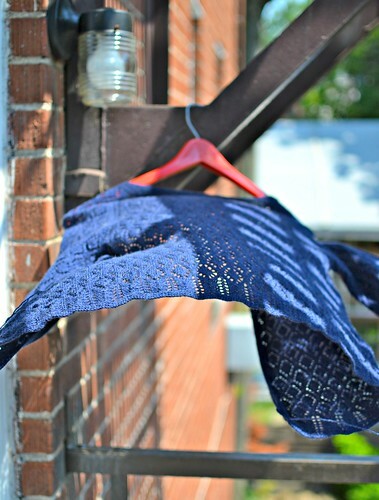 I am pleased to report that Fresh Designs: Shawls is now available from Cooperative Press! 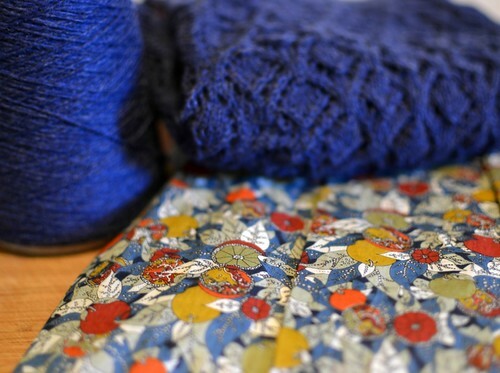 The source of my pleasedness is that a shawl design of mine is in there. I named it Iris because of the somewhat eerie resemblance its central motifs bear to eyes with long fringed lashes, some open and some closed. The book is available digitally or in print or both from the publisher. You can also buy the digital edition from its source page on Ravelry, where it will be conveniently added to your library. You all know that Shannon and Elizabeth from Cooperative Press are awesome, right? With our powers combined we'll be running an Iris shawl knitalong starting up in the next few weeks, hosted in the Cooperative Press group on Ravelry. 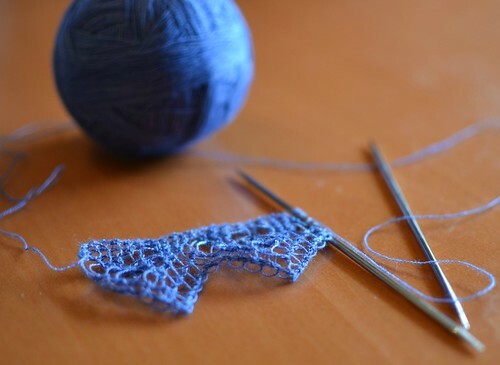 I know that lace knitted without resting rows can be complicated to follow and technically challenging to knit—but we'll go at a relaxed pace, I'll share as many tricks as I know and solicit yours, there'll be an amazing prize, and it'll be a fun project to usher us into fall. If you want a free copy of this book among others and are a Facebook user, here's a handy contest link to click on during the month of August! One lucky dog will win all four of the newly-released Fresh Designs books, plus Audrey Knight's fascinating Reversible Scarves. I haven't made up my mind about what yarn I will use—stay tuned for a post about factors to consider when choosing yarn for cobwebby garter stitch lace stuff!—but the strongest contender at the moment is Love Potion #3 from The Gossamer Web, which is a 36/2 cashmere/silk/merino yarn. Susan dyes beautiful vivid colours and has her bases custom-spun for her with an eye toward wedding ring shawls, and the yarns are very rewarding to knit with: they're soft but don't sag, crisp enough to hold a firm blocking and to block out huge, and variegated with discerning subtlety. This ball contains 1250m of yarn and has been patiently waiting to learn its fate for about two years; maybe its time has come! Only swatching will tell. P.S. Another awesome thing about Shannon and her publishing company is her new magazine, Knit Edge. It's going to be a combination of interesting, challenging knitting and crochet patterns and detailed articles like you might have found in the late lamented FiberArts. To celebrate the book release, she's given me a coupon code to share—use freshdesigns when you buy a one-year subscription to Knit Edge from this page for a dollar off, and one randomly-selected subscriber will have their entire subscription cost refunded sometime this month. Hooray for free things! Today was windy, overcast, and intermittently drizzly, so we went to Port-la-Joye/Fort Amherst to admire the hawthorns and the earthwork ruins. 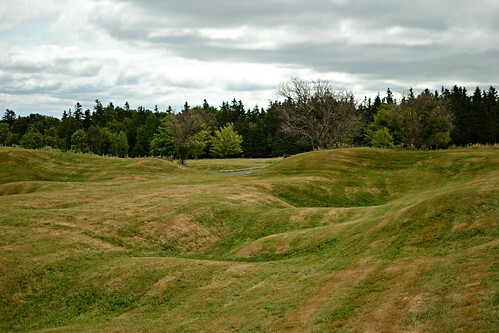 The remains of the fort strongly resemble golf course obstacles, especially since Parks Canada keeps them mowed. There were also pretty woodland and meadow plants in abundance to complement the hawthorn spikiness, and I am completely satisfied with the trip. 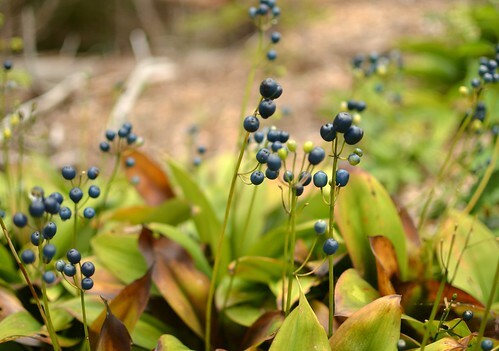 These berries are the fruits of lilies, and are a startling dark greyblue! 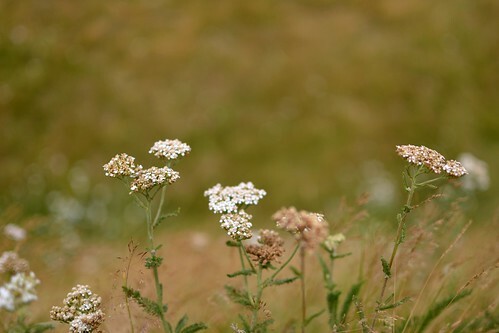 And the remnants of this year's Queen Anne's Lace yarrow are everywhere. 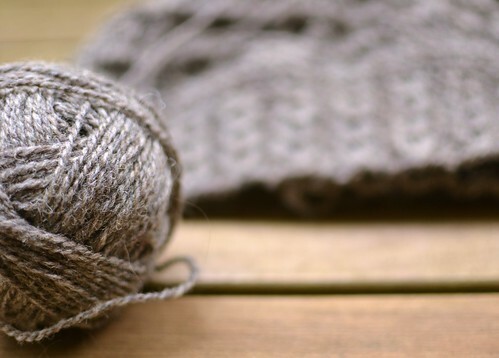 It is a perfect cool afternoon for settling in outside with warm woollen knitting, so I am planning some quality time with Macausland 2-ply Medium project #2. I'm not ready to show it off to anyone yet, but look at the colour—it's a warm grey-brown that changes with the light. The woollen-spun yarn is reasonably smooth in the hank, but it bursts into bloom with blocking and creates fabric that's thick and supple and light and warm. Perfect. 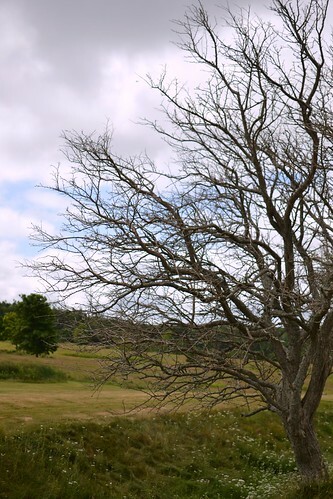 My partner and I had an eventful road trip from Toronto to Prince Edward Island—car trouble in the middle of a long weekend left us stranded in a sleepy town in southeastern Ontario for a few days. This was the beautiful scene where the alternator died (that's the St. Lawrence River, with New York across the water). 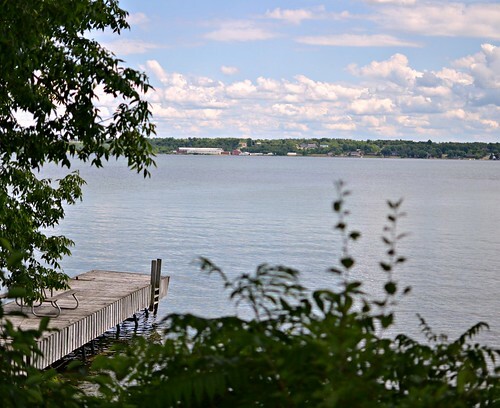 There are definitely worse places to be stranded than Morrisburg, which is scenic and quiet and a good place to have a spontaneous vacation for introverts. 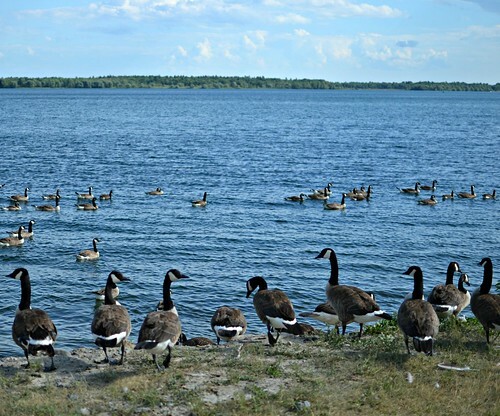 We rescued some books from the car and read for three days, broken up by walks along the seaway to hassle some dignified geese. Once we got the car back the rest of the trip was uneventful, and since we arrived I have been sprawled languorously in a comfortable chair on a deck in the shade, knitting with my favourite PEI yarn, Macausland's 2-ply Medium. The spongy Merino DK from Belfast Mini-Mills and the luxury yarn from Fibre-Isle are close runners-up, but my heart belongs to crisp sturdy wool I can knit into fabric that will outlive me. These mittens fell off my needles in an afternoon and evening, so I want to share them with you. They have ribbed cuffs (practical!) whose knit columns meander around one another over the backs of the hands (dense and warm! ), eventually narrowing to a pointed tip (whimsy! ... I really can't get enough of mittens with pointed tips, and you could round these ones off if you'd like, by omitting the rounds without decreases toward the end of the tip shaping). If you can't get your hands on Macausland yarn you have my sympathy, and I suggest another woollen-spun heavy worsted like Briggs and Little Heritage. 1 set of 5 US #6/4mm double-pointed needles, OR 32" circular needle for Magic Loop. Adjust needle size if necessary to obtain gauge. 7.5"/19 cm hand circumference, measured above the thumb. Hand length is adjustable. 18 sts and 32 rnds = 4"/10 cm in stockinette stitch (knit every round), after blocking. 24-st-wide cabled panel should measure 3"/7.6 cm wide after blocking. CO 44 sts. Join into the rnd, taking care not to twist, and pm. Next 20 rnds: (P1, k2, p1) around. 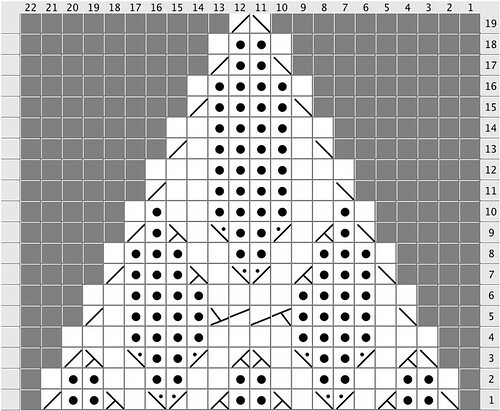 Next rnd: Work rnd 1 of Right Hand chart across first 24 sts, pm, k to end of rnd. Next 2 rnds: Work next rnd of Right Hand chart to marker, k to end of rnd. Next rnd (inc rnd): Work in est patt to marker, M1R, k1, M1L, pm, k to end of rnd. Rnds 1–2: Work in est patt to first marker, k to end of rnd. Rnd 3: Work in est patt to first marker, sl marker, M1L, k to next marker, M1R, sl marker, k to end of rnd. Repeat last 3 rnds until there are 13 sts between markers. Next rnd: Work in est patt to first marker, sl marker, sl next 13 sts to scrap yarn, remove next marker, CO 1 st using the backwards loop method, k to end of rnd. Next rnd: Work in est patt to first marker, k to end of rnd. Cont as est until mitten measures 3"/7.6 cm above the thumbhole, or just covers the tip of the little finger when tried on, ending on rnd 10 of patt. At end of last rnd, remove marker after Right Hand patt and shift end-of-rnd marker 1 st to the left as foll: remove marker, k1, replace marker. Setup rnd: Work rnd 1 of Right Tip chart across first 22 sts in rnd, pm, ssk, k to last 2 sts, k2tog. 4 sts decreased. Rnd 1: Work next rnd of Right Tip chart to next marker, k to end of rnd. Rnd 2: Work next rnd of Right Tip chart to next marker, ssk, k to last 2 sts, k2tog. 4 sts decreased. Repeat rnds 1–2 until all charted rnds have been completed and 4 sts remain. Break yarn, thread it through rem sts, and fasten off. Transfer 13 held thumb sts to needles. Join yarn at CO edge above thumbhole. Pick up and k 3 sts from CO edge, k13, pm. 16 sts. K every rnd until thumb measures 2"/5 cm, or about 0.25"/0.5 cm shorter than desired finished length. Next rnd: (K2, k2tog) around. Next rnd: (K1, k2tog) around. Next rnd: Work rnd 1 of Left Hand chart across first 24 sts, pm, k to end of rnd. Next 2 rnds: Work next rnd of Left Hand chart to marker, k to end of rnd. Next rnd (inc rnd): Work in est patt to marker, k to last st, pm, M1L, k1, M1R. Rnd 3: Work in est patt to last marker before end of rnd, sl marker, M1L, k to next marker, M1R. Next rnd: Work in est patt to last marker in rnd, remove marker, sl next 13 sts to scrap yarn, CO 1 st using the backwards loop method. Cont as est until mitten measures 3"/7.6 cm above the thumbhole, or just covers the tip of the little finger when tried on, ending on rnd 10 of patt. At end of last rnd, remove marker after Left Hand patt and shift end-of-rnd marker 1 st to the left as foll: remove marker, k1, replace marker. Setup rnd: Work rnd 1 of Left Tip chart across first 22 sts in rnd, pm, ssk, k to last 2 sts, k2tog. 4 sts decreased. Rnd 1: Work next rnd of Left Tip chart to next marker, k to end of rnd. Rnd 2: Work next rnd of Left Tip chart to next marker, ssk, k to last 2 sts, k2tog. 4 sts decreased. Weave in all ends, but don't cut them off yet. Use the end at the base of each thumb to mend any holes in the area if necessary. Block mittens by soaking in lukewarm water, squeezing out excess water in a towel, and laying flat to dry. Pat the cuff ribbing into shape without stretching. 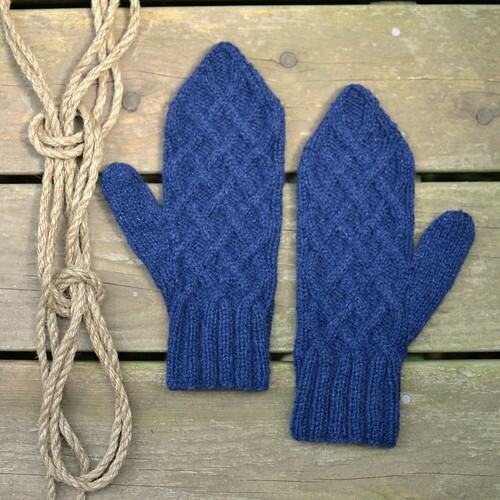 When mittens are completely dry, cut off the woven-in ends and wear with glee. The knitting on my hopefully-I-can-wear-this-on-Saturday cardigan is finished; it didn't dry overnight on my living room floor (and who could blame it in this weather), so this morning I hung it out on the fire escape while I slung garbage bags and boxes around. Dry in twenty minutes! With twenty-six hours to spare! More anon when I am less crunched for time. In the meantime, the yarn is a 2/15NM cashmere/merino from Colourmart; the pattern is a plain old top-down raglan with lace bits all over it and many short rows starting at the bust point to add length to the fronts. I have a feeling I will want more cardigans much like it. I am provisionally declaring my jam spectrum project finished. There are twelve jams, jellies, and marmalades all told. 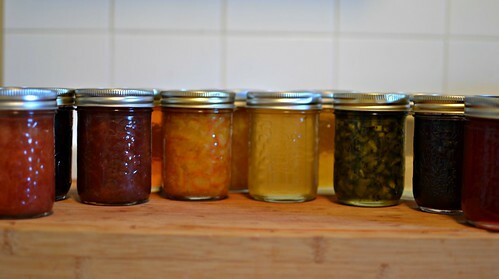 Left to right: red plum and white pepper jam; cranberry, hibiscus, and ginger jam; rhubarb and lemon marmalade; apple and jasmine jelly; tangerine and rosewater marmalade; Meyer lemon and vanilla marmalade; rosemary and lemon jelly; lemon and camomile jelly; kiwi and jasmine jam; dill jelly; blueberry, lemon, and vanilla jam; black plum, blackberry, and cardamom jelly. Whew. There are more oranges and yellows than anything else and the blueberry one is not especially blue, but it looks indigo next to the black plum and blackberry jelly, which is quite purple. If I discover borage in bloom that someone will give me before next Saturday, though, I will make jelly out of that and switch it out for one of the yellow things in the middle. Meanwhile the rest of my life looks basically like this. 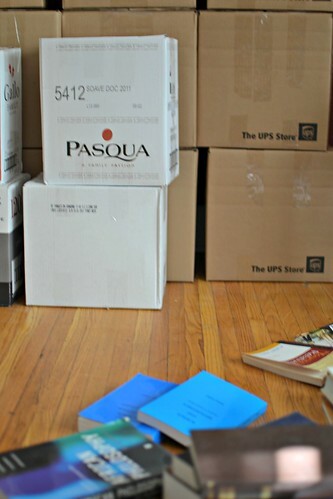 We have not too many hundreds of books, but taking an inventory of all of them and dividing them into piles for shipping to various places (dissertation pile! postdoc-maybe pile! someday-book-project pile! wait-I-meant-to-read-that pile! why-did-we-buy-this pile!) is time-consuming and tiring and hot work in the heat wave that has settled over my city. Now that the jam project is polished off and I need breaks from and rewards for packing, I have turned my attention to a cardigan project from a few months ago, and have added a deadline to it. I have an amazing Liberty dress with oranges! on it, with which the cardigan will coordinate handsomely. It's a top-down raglan one and I intend for it to have elbow-length sleeves; right now there's about an inch of body left to knit, with sleeves, front bands, and neckband remaining. If I can also finish this before next Saturday, I will be extra-adorable at the wedding of the friends for whom the jams are intended. WE WILL SEE. This afternoon I spent some quality time with the sewing machine, making a little bag for a lens that didn't have one. It was a pretty good time—with some fun hand-finishing details for extra cushioning and sharpness of appearance—so I'll share! Also illustrated: the drama of the shift from late-afternoon to early-evening light through my apartment's west-facing window. something to use as a drawstring—a length of cord, a ribbon, hot pink seam binding ribbon? Measure the diameter and length of your object. Add 3" to the length measurement for seam allowances and space for gathers. Divide the diameter measurement in half, and add 1" for seam allowances and at least 1/2" for ease (add more for a looser bag). Make a note of the resulting numbers—mine were 8" length and 6" width. Cut two pieces each of shell fabric and lining to these dimensions. Cut two pieces of batting slightly larger. Set aside the lining pieces for now. Smooth each shell rectangle against a batting rectangle. Mark quilting lines on it with a hera marker or fabric marker (if you have neither, use the needle you use for weaving in ends from knitting projects to draw creases). 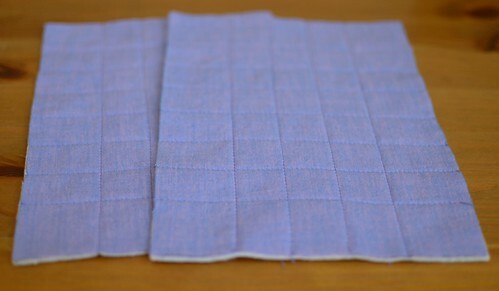 I quilted a 1" grid, leaving an extra 1/2" all around for seam allowances. Cut off the excess batting around the edges of the shell fabric rectangles. Put them right sides together and sew up the bottom and sides at 1/2". To make the padding for the bottom of the bag, measure the bag bottom and cut 4–6 squares of batting slightly larger than it. 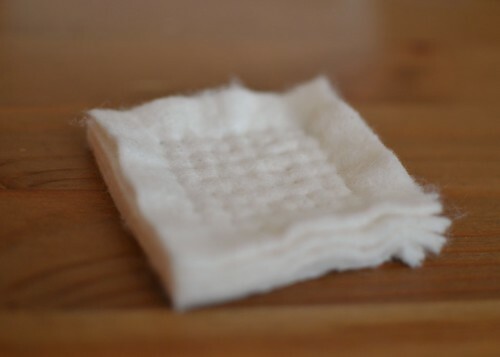 Arrange them in a stack and sew them together with a fairly closely-spaced grid of prick stitches. The goal is to make the batting stack into a firm square of padding about 1/2" thick; the neatness of your prick stitching is immaterial as it'll be completely hidden in the finished bag. Once the padded square is finished, tack it to the inside bottom of the shell, and turn it right side out. 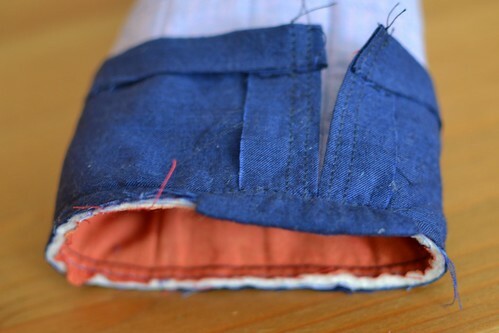 To make the lining, place the lining rectangles right sides together and sew around the sides and bottom at 1/2". Form the bottom of the lining the same way as for the shell. Slip the lining into the shell and trim the raw edges at the top to match. Baste them together at 3/8", easing the lining to fit, then sew them together at 1/2". To make the drawstring casing, measure the diameter of the bag and cut a piece of fabric 2" wide x that measurement + 1". 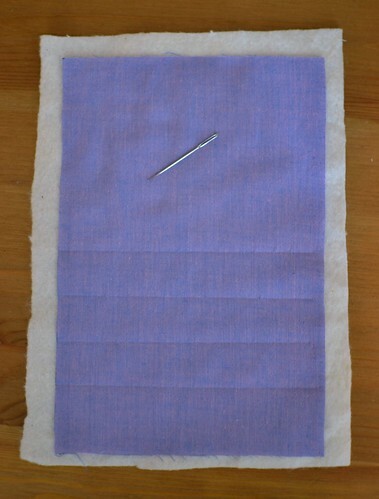 Fold the short ends in 1/2" and press; fold one long edge in 1/2" and press again. Edgestitch close to the fold along each short end. 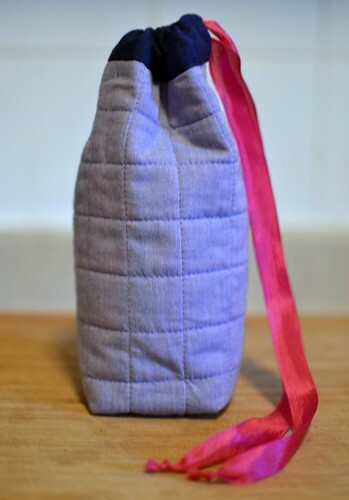 Attach the drawstring casing to the bag by pinning the unfolded edge to the edge of the bag, right sides together. Stitch at 1/2", then trim the seam allowance to 1/4". Cover the raw edge of the bag where the drawstring casing will open by cutting a piece of the drawstring casing fabric 1" x 1.5". 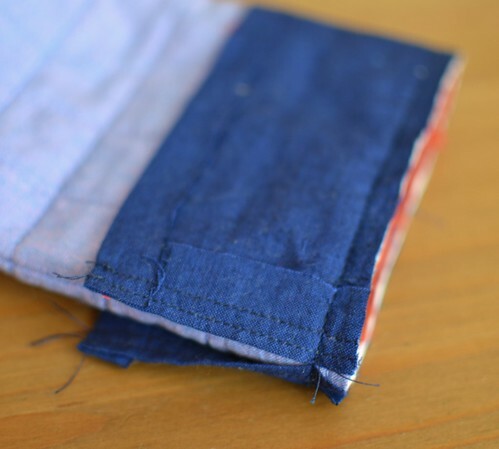 Fold in half lengthwise and press, unfold and fold the long edges toward the centre and press again, then fold in half again along your original fold line (like making double-fold bias tape, but with fabric cut on the straight of grain.) 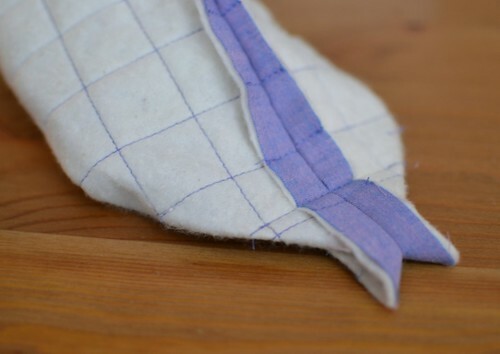 Pin the folded piece around the raw edge where the casing ends meet and slip stitch in place, first on the outside of the bag and then on the inside. 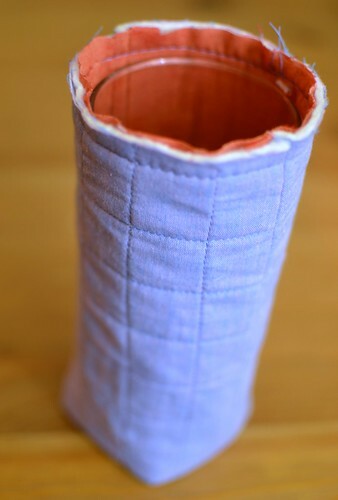 Finish the casing by folding it to the inside and slip stitching the folded edge to the lining. Finish the ends of the drawstring as you prefer. Attach a safety pin to one end of the drawstring and thread it through the casing.